Within archaeology, and certainly in several of our blog posts, you will hear the term stratigraphy. So, what exactly do we mean by stratigraphy? Within any archaeological site there are different layers of stuff—artifacts, rocks, different kinds of dirt or sediment—and each of these layers may contain different things from the layers above or below it. We consider each layer to be a stratigraphic unit, or strat for short. In some cases these strats can be the result of human activity (e.g., making fires) or when a river floods and leaves behind a deposit of sand and clay. All things being equal, over time strats build upward and older strats are continuously covered by younger strats. A photograph of a layer cake borrowed from Google (left), and a hungry archaeologist’s version of the same cake (right). In other words, imagine a triple-decker cake as a substitute for an archaeological site. This cake has chocolate cake on the bottom, strawberry in the middle, and white cake on the top. Between each level of the cake are layers of frosting. When you cut into this hypothetical cake, you will be able to see all the different layers, and to an archaeologist each layer of this cake (e.g., the chocolate, strawberry, and white cake as well as the different frosting) can be considered a unique strat. Actually, archaeologists even refer to very distinct ideal layering within a site as “layer-cake stratigraphy” (a classic example of “layer-cake” stratigraphy from an archaeological site in the Lower Pecos is Arenosa Shelter, which you can learn more about here: www.texasbeyondhistory.net/arenosa). When you study the different strats within the cake, you can start determining the order in which the cake was constructed. For example, the chocolate cake layer at the bottom is the oldest part of the cake, and then the strawberry frosting was spread on, and so on). As you study and record how the different cake and frosting layers were placed onto the cake, you begin to understand how the complete cake was created. Understanding how a site (or cake) formed is what archaeologists call site formation processes. Now, to jump back to stratigraphy in Eagle Cave. One of the tragedies about Eagle Cave is when the University of Texas wrapped up their excavations in 1963, they left all of their excavation units open (as did the Witte Museum in 1936). Over the past 50 years all the walls have collapsed, but there are still large depressions where the units once were. When we (Steve and Charles) began writing the research design for Eagle Cave, we knew we would be able to take advantage of the existing units to expose any intact stratigraphy. 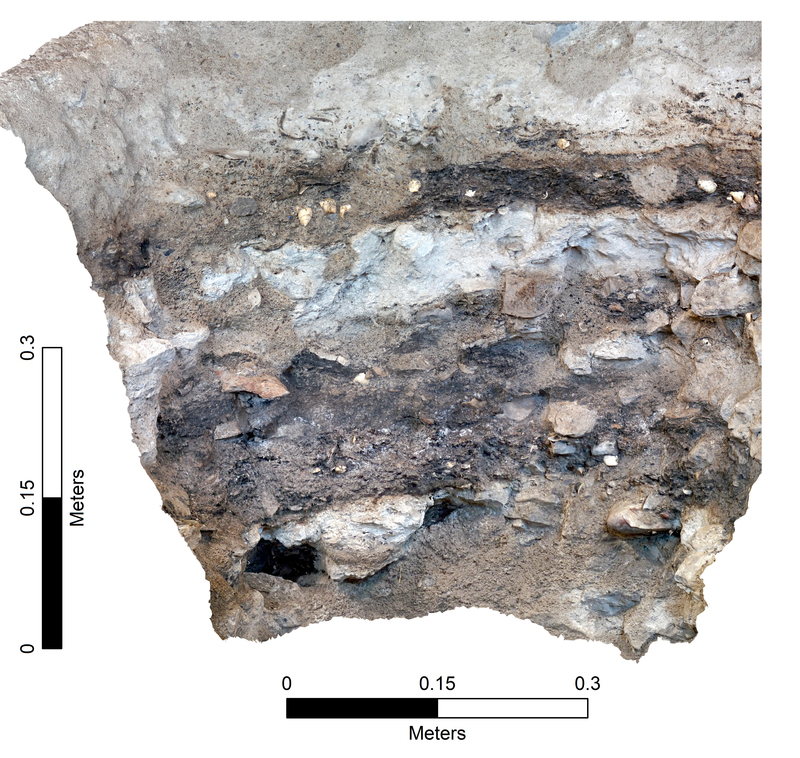 However, we knew from previous excavations at Eagle Cave the stratigraphy is anything but layer-cake—dozens of thin, hard to see strats mixed in with thick, rocky strats all churned up by rodent burrows and human-dug pits—in short, extremely difficult stratigraphy to carefully document and understand. So, the big challenge became: once we expose the stratigraphy, how should we document and sample the complex layering within the site while minimizing the overall impact our project has on the remaining intact deposits? What we decided upon was to use a version of Steve’s Strat System from his work in Belize in the early 1980s, and came up with the motto, “Low Impact-High Resolution,” meaning we want to learn as much as we can while doing the least damage to the site. To go back to our layer-cake analogy, imagine you are a food critic and you have 10 of your closest food critic friends coming to sample every layer within the cake tomorrow. But, because the cake is so delicious you need to save enough cake for 10 more food critics to sample the cake every 50 years for the next 10,000 years (fortunately this hypothetical cake never rots). Over the next 6 months (and likely on and off for several years) we will be documenting the stratigraphy of Eagle Cave at dozens of different spots. All of these exposures will be in areas which have been previously excavated or dug into by critters or artifact collectors so we are only damaging small portions of the intact stratigraphy. We are calling these Profile Sections. Yesterday we documented and began to record our first profile section: PS001. The location of PS001 was selected because there was a large animal burrow and adjacent backdirt pile, and we could just make out what appeared to be intact stratigraphy above the burrow. The burrow angled downward into the deposits (and can be seen toward the bottom of the profile), but by cutting back only a few centimeters above the burrow we were able to expose ~60 cm tall profile section. We were very surprised to encounter intact stratigraphy only a few centimeters below the ground surface, so we are very encouraged to begin exposing and documenting additional Profile Sections. Image of PS001 exported from ArcGIS. A 3D model of 60 photographs was used to produce the image. Today we began documenting the different strats in PS001, but those descriptions are incomplete. When we begin our sampling we will likely take small matrix samples out of each identified strat, and screen the material through nested geologic sieves. We will then be able to coordinate with our collaborators (like Phil Dering and Charles Frederick, among others) to begin analyzing all the different material in each strat – sediment, plant parts, animal bones and so on. This is where High-Resolution comes into play. We want to systemically sample each strat individually so we can gain a more detailed understanding of when and how the site formed over time, how the site was used during different time periods, and use the data to address many other questions. Feel free to check out the 3D PDF of PS001 at the Link below! This entry was posted in Eagle Cave, Excavation Methods, Spring ENC 2014 Posts. Bookmark the permalink. Nice post, Charles. I tried downloading the 3d pdf of PS001 3 times but it always came out a white page with a single line of text on the bottom right. Is this a problem with my internet or your file? Thanks, Charles. I think it should still work–when the screen with the single line of text shows up at the bottom, try to download the file onto your computer (sometimes hovering the mouse over the image will pop a download icon at the bottom). Once the file is downloaded, you should be able to open it and manipulate it.